A beautiful architect's house in Bexley gets its own modern walk-in wardrobe. Samir came to Lozi wanting to renovate an unused room in his beautiful home in South East London. Here, Samir's designer-maker Dylan talks us through the design process, manufacturing and practical considerations that went into creating this bold, practical and elegant space. Samir's large plywood wardrobe, with two facing wardrobe sections. His wife's side of the wardrobe. Samir's side faces his wife's. Samir came to Lozi wanting a walk in wardrobe - what were the main considerations with this project? Samir had this room in his house he wasn't really using - a quite small and dark room with a door onto a balcony and this beautiful wooden beamed ceiling. He wanted to declutter his bedroom by turning this unused space into a large walk-in wardrobe for him and his wife to share, with plenty of storage space for all their clothes. He wanted all this clothing to be easily accessible and to have more than enough space to easily accommodate all their belongings without it feeling cramped or too cluttered. He wanted this space to become a luxurious yet practical space for the couple to get ready in the morning. Samir's room before Lozi's renovations. Samir's Wardrobe after Lozi's renovations. Samir really wanted to make the most of this space, so this was clearly going to be a large wardrobe. One of the major design decisions was to forego doors in favour of an open plan design as Samir wanted to see everything as soon as he walked in and the space was quite dark so the clothes didn't need to be protected from light. 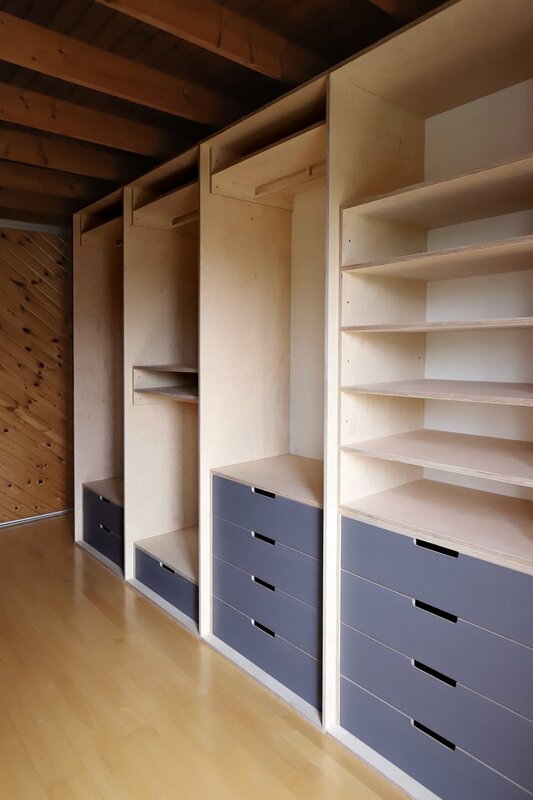 We chose to keep the birch plywood finish as it is so light and airy but then contrasted it with dark grey drawers to draw the eye down and make the ceiling seem higher. Samir and his wife each have one half of the wardrobe - his wife's side has been designed with taller hanging space for full length dresses whereas his side is made for suits and shirts with ample drawer space. 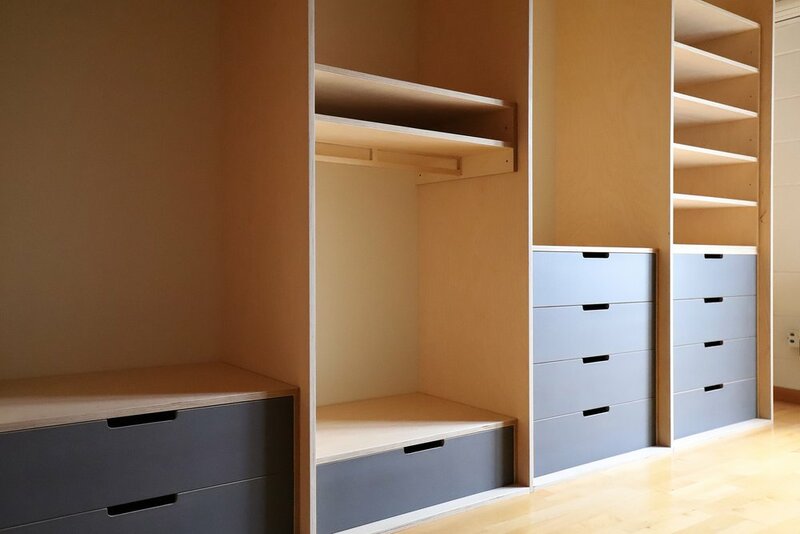 We varied the design of each segment to make this wardrobe completely adaptable - not only does it bring visual interest and rhythm to the space but it also ensures the wardrobe accommodates any type of clothing the couple may own. 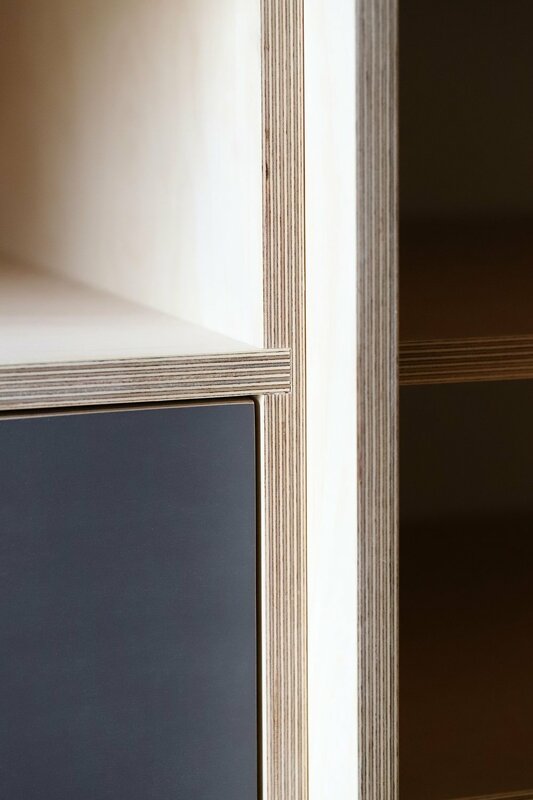 A close up detail of the plywood joints. Ample drawer space allows the couple to easily store all their clothing. Each drawer comes with durable plywood runners. Were there any particularly tricky aspects to this project? Getting it in! Samir lives in a beautiful 1960's architect's house, stunningly designed but really not made for moving large furniture in and out of. We had to very carefully measure every single corridor, door frame and stairwell to figure out how we were going to manoeuvre it in before designing it. We then built the wardrobes in several pieces and did a lot of the assembly work in situ instead of in the workshop as we would usually. On the plus side, Samir now has a fully modular wardrobe that can adapt to his next home should he ever move! The dark grey drawers help elongate the space. A different design for each segment makes the space more interesting whilst accommodating all different types of clothing. The smooth handles on each drawer. And what did Samir think of it? "The build quality is excellent - in my opinion much more durable than fibreboard alternatives. Excellent service which included prompt replies to my questions, an in depth site survey, and the final installation. The owner, Soroush, installed my wardrobe personally and was able to stand by the quality of his work, which says a lot. The price was also quite reasonable, which makes the overall product good value for money. Overall, really pleased with the work that was done." Samir, Via Google Reviews. Lozi offers a range of wardrobe options adapted to your needs and your home. You can see a selection of our designs over on the Wardrobe page of the website. Inspired to start your own project? Get in touch! Looking for some more ideas for your bedroom?